… or goodbye bread machine. There’s been a growing buzz about this book on the web and I finally managed to get a copy last week. I’ve made one batch of dough so far and while the results are not perfect yet, they are startlingly good for such a low-effort method. They are certainly far better than any bread machine bread I’ve tasted. Basically you make a large batch of rather sloppy dough using unbleached plain flour (not bread flour), and store it in a bucket in the fridge (no kneading; just mix it all together). When you want some bread, pull off a lump, shape it, and let it rest at room temperature for an hour, before putting it in the oven. Half an hour later, fresh crusty bread! You can keep the dough for up to two weeks; my first batch lasted five days, and the last loaf I made with it had a pleasant sourdough flavour and improved texture compared to the first one. The recipe needs tweaking to account for flour (the book is American, so it assumes US flour); my first loaf was rather dense, so I adjusted the water in the second batch. Even with this over-stiff dough, I had better results by shaping the loaf in the evening, letting it rise in the fridge overnight, and baking it in the morning. The recipe is here, but although it’s simple, you need the background information and notes on techniques to succeed. The authors are a pastry chef and a scientist, and they combined their expertise to arrive at a formula that works if you are using American flour. The critical feature is the protein content of the flour, which affects how much liquid it absorbs; it should be around 10-11%, and French plain flour is only around 9%. I was hesitant about how to adjust for this, so I posted a question on the authors’ website and they responded personally within hours! They have very active discussions going on there, which give another dimension to the book. There are also some handy videos which helped to confirm that my dough was the right consistency. Oven thermometer: the authors insist you should verify the temperature of your oven with a thermometer, so I did. And it was fine, so I haven’t bothered with it since. Baking stone: it really does make a difference. I bought a cheap pizza stone, and the crust is fantastic, streets ahead of bread-machine bread. You also put a roasting pan in the bottom of the oven and pour a cupful of water into it just as the bread goes in. This is a technique used by French bakers to produce good crust (except they have steam ovens so they don’t need this low-tech method). No need for a pizza peel as specified in the book. I just put the dough on a flat, edgeless non-stick baking sheet sprinkled with polenta, and it slides off fairly easily; I nudge it with a spatula if it doesn’t. Measurements: of course all the measurements are in cups (groan). I finally cracked and bought a set of cup measures. As a result I discovered that an American cup is significantly smaller than I thought it was, only about 220 ml. I had thought it was 250 ml, which could explain why my attempts at American cake recipes have been so unsuccessful. Flour: this is the main conundrum. French plain flour is quite soft. I started with 3 cups plain flour to 3 1/2 cups bread flour, and the dough was too stiff. For my next batch I kept the amount of water the same, and reduced the bread flour by half a cup. The crumb is still a little dense, so I’ll continue to tweak. It’s better when risen overnight in the fridge. The results are definitely good enough that I’m encouraged to persevere. You might think living in France guarantees access to good bread, but unfortunately it doesn’t. Real pain au levain is increasingly hard to find, and the plain common-or-garden baguettes from our local boulangerie are pretty dull. So I’m delighted to find a way of making my own bread which is almost effortless and brings back the real taste of bread. Besides, a baguette bought on Monday is only good for breadcrumbs by Tuesday, so we end up throwing quite a lot away. Now I can bake just enough for a day, and even leftovers are fine the next day. I baked a biggish loaf on Tuesday morning, and it is still excellent. The book isn’t just one recipe either, it also includes various other breads and baked goods which I’m itching to try. Must go, I have to make some brioche! This works out to 74% hydration. Usually, I leave a small amountr of dough from the previous batch in the bucket, for extra flavour, cutting the yeast down to one sachet. I also roll the ball of dough in the flour when I’m shaping it, to stop it sticking and pulling, and use baking parchment on the tray when it’s rising. I also made the wholewheat sandwich bread in the book, and it was delicious; I used pain de campagne flour and it worked really well, despite being abandoned for several hours before going in the oven. Fantastic! Thanks Deanne. I admit I haven’t had time to do much more experimenting; I adjusted quantities in my second batch (and remembered to weigh the flour after measuring this time!) but ended up with a dough that I think is too wet, so I’ll check that forum out for the next batch. PS but even my rather flat loaves taste great! Here is a picture from the author’s website http://zoebakes.com/?p=204 – it is supposed to be very wet. My second batch that I used the weighing instead of by the cup method turned out better. Hope this helps, I don’t even have the book yet – can’t wait to get it! Yes, my second batch is a bit wetter than that; I corrected too far after the first batch. I’m definitely going to use the weighing method next time — I hate those dang cup measures anyway 🙂 Thanks again for telling me about it! Hi all… I’m Jeff Hertzberg, one of the co-authors. Thanks for trying our method. One way to deal with the softer flours you’re encountering would be to use vital wheat gluten, if that is available to you. Come visit us at http://www.artisanbreadinfive.com and post questions into any of the “Comments” fields, or by clicking on the “Bread Questions” link on the left side. Thanks for your help! I’ve been getting better results by using the hydration method; my current batch is 78% hydration and is pretty good. I may reduce the proportion of bread flour in the next batch to see if I get bigger bubbles that way. Hmmm, good-bye bread machine indeed! What a fabulous looking loaf you’ve created! Mine are not always quite so pretty, but I’m happy to say they do always taste great and the family is always asking for me. Isn’t this just a brilliant method of having fresh bread at home, when you need it rather than having to set a lot of time aside? Thanks for your encouragement to weigh the ingredients – it is a lot easier to work with, I think. Thanks again! Yes, weighing the ingredients makes the result much more predictable. It’s brilliant, isn’t it? I haven’t bought bread for months! Artisan Bread in Five Minutes a Day is a wonderful way to begin baking bread on a weekly (or, as it ends up…daily. I have baked at least six to eight of the books recipes. Soft White Bread-excellent. Vermont cheese bread-deliciious,Basic Boule-better than any store bought bread because it is so fresh. Whole Wheat recipe was made into soft breadsticks to serve at an impromptu picnic last week. My husband loved them. Buttermilk recipe was made into eight petit loaves and dropped off for the local library. I wrote a book review of this bookfor their website and wanted them to try a bite of it. Wrapped each loaf in a white paper doily tied with lime green raffia. The pizza dough recipe was very soft and flavorful, but do not bruch the exposed edge of the dough with olive oil. It became tough. I froze the remaining pizza dough and will let you know how that goes at a later date. Right now I have cranberry rye bread in the fridge. You heard me correctly. I tinker around with the recipes. It smelled delicious just fermenting on the counter yesterday. I started bread baking last April with The Bread Bible (Rose Levy Berenbaum. Excellent, excellent recipes….major time and intellectual investment for the beginner. But in hind sight this was a super start. You start with the most challenging method, keep attempting to produce the best results and then find a simple book like this and you realize just how much knowledge and experience you have gained. How much value was in learning the traditonal, no-short cut way. It is imperative to make less than good batches of bread. When you produce a winner, you recognize it immediately! Bonne Pain to All. This is Amy with a followup to the posting of 30th September. Apologize for some typigraphical misspellings. I was in a hurry. The deli-style rye bread in Artisan Bread in Five Minutes was a great success! Dried cranberries add to dough is delightful. Flavour of this bread was excellent. I mixed dough on Monday AM, refredged until Wednesday PM. Mixed only a half batch of dough to test the flavors. I almost always test a new recipe by making half batch. Waste fewer ingredients that way. 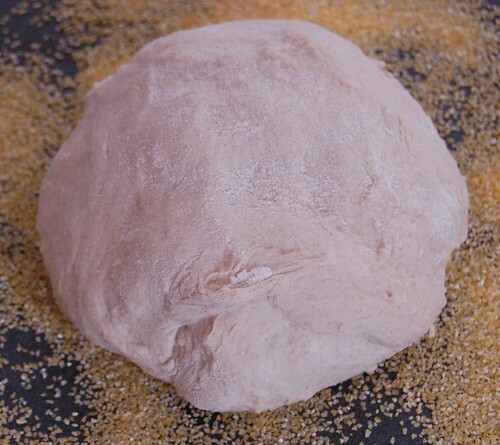 By the way, the word dough may be misleading beginner bakers. For these recipes it is more accurate to say that the correct dough consistency looks more like thick biscuit batter. Rather than dry like pastry crust or cookie dough. This is critical. Bread flour is all I ever use for these recipes. Very early in their book they mention this in passing. Just reduce the flour volume by about 1/4 cup per 6 cups or regular all-purpose flour. It is imperative that you allow the dough to fully rise and then begin to deflate on its own. In my kitchen, it almost always takes more like three hours. You must train yourself not to bother the process prematurely! We have limestone floors and granite countertops with not sun exposure. Our kitchen is perfect for pastry baking. I frequently raise dough in the warmth of my oven with its light turned on. Be very careful about your measuring. I say this because there is not a 1/2 tablespoon measuring spoon that I can find. One tablespoon equals 3 teaspoons. For a half order of the recipe then you use 2-1/4 teaspoons of yeast and salt. One and a half tablespoons equals 4-1/2 teaspoons. It is too easy to make a mistake in this area. Physically write down in the book, the conversions. Never hurry, guess or estimate. 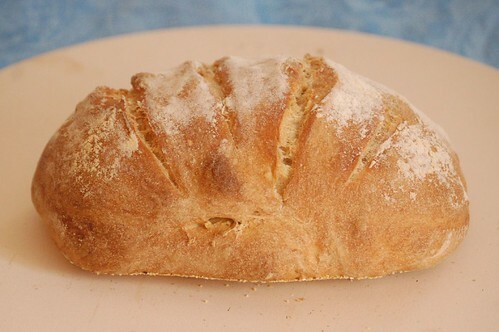 They do not mention this directly, but one of the great advantages to their baking method is that the bread contain no preservatives and not synthetic chamicals, especially if you are using “organic” ingredients. Read the labels of your ingredients. All buttermilks are not the same. Buy the one with the fewest and most pure ingredients. I only bake with fine sea salt. Today I prepared the dough for herb bread. Next time I will let you know how it truned out. This is the followup to the “Five Minute” herb bread recipe. A half batch of the boule master recipe was prepared. Added to it was 1/4 teaspoon each of dried rosemary, dried thyme and a shake of dried Italian seasoning. Also to the flour mixture before mixing with wet ingredients, two teaspoonfuls of vital wheat gluten was added. Hodgson Mill brand was used. It was purchased as part of a whole wheat bread recipe. But, when I read the box, it suggested using it for all bread recipes. It is mostly Vitamin C which acts like a natural preservative. In my distraction yesterday, I made an error and,rather than mixing the dry ingredients into the wet, I did the reverse! The dough rose for its three hours and was refrigerated for four hours. Then I baked a small sample loaf, 16 minutes at only 430 degrees. It was truly an outstanding bread. I was shocked. The crumb was much more open and soft and irregularly holed than many others. Crust was a bit more crispy. I happen to prefer soft crust breads, but this was still chewable. This herb bread to incorporate almost any herbs or spices you would want to coordinate with any particular type of meal or regional cuisine. We ate the entire loaf with cannellini bean and vegatable soup and a wedge of Greek goat and cow cheese along with a green salad. I am still working through all of the recipes in Artisan Bread in Five Minutes a Day. Just now baking off Oatmeal Pumpkin Bread, page 100. I used canned pumpkin, apple cider instead of the water, and , in addition to the honey, two tablespoons of light brown sugar. This is a delicious autumn bread for breakfast with marmelade or with sliced baked turkey with cranbverry chutney. A wonderful deep brown coulour tot the crust also. As a follow-up to the first batch of Olive Oil Dough I made…I froze the dough in leftover portions in individual pizza servings so we could use it at a later time. Thawed a piece about the size of a large orange in a freezer bag. Thawed the dough overnight in the refrigerator. Last night just as I heated the oven, I pulled it out of the fridge, dusted it with bread flour lightly and with a rolling pin, formed it into a very thin oval. Without toppings, it was baked at 475 degrees for about 4-5 minutes. If necessary, while it is in the oven the first time, poke the baking dough with a fork to deflate any large air pockets that form. This ensures a flat surface on which to place the toppings. After a few minutes, remove the partially baked crust from the oven. Immediately place toppings on pizza crust and complete the baking in about ten minutes time in oven. This was the prettiest, most tender crust I have ever made!!. Any the flavour is pleasant, not dry, floury or doughy. My sheet pan was sprinkled with polenta (cornmeal) before placing crust on it to bake. This morning I just mixed a half batch of page 82, Broa, corn bread. Again, I substituted apple cider for the water. Seems to be raising quite well. Will let you know how it bakes off and tastes a few days from now. I love it, just made it today. Am in the UK so used plain flour and it came out alright. Will definitely get the book now and try more, will also tweak a bit. but for a first go it’s blooming perfect!